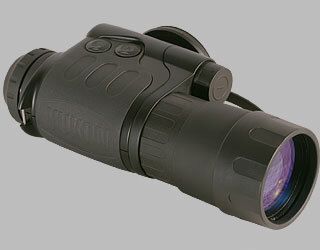 The Exelon 4x50 night vision monocular with a super tube is a professional device with enhanced image quality through the entire field of view. A unique optical arrangement of the objective lens, coupled with a new, specially designed tube of a new type, has contributed to the high resolution and lack of distortion through the entire field of view. This unit operates both in the passive mode (without man-made sources of light) and in the active mode (with the IR illuminator on). The Exelon 4x50 is designed for outdoor observation, guarding and terrain orientation within a wide range of natural night light - from twilight to total darkness. The Exelon has a built-in IR-illuminator intended for use in moonless cloudy conditions in total darkness. The unit is equipped with two 1/4 inch sockets that allow the device to be attached to a head mount and used as a mono goggle. Its surface is rugged for extreme field conditions. The Exelon unit is fully self-contained and can work up to 50 hours on one CR123A battery at temperatures ranging from -30 °C~+ 40 °C. Optical Arrangement Due to the spherical shape of the tube’s photo cathode, the device produces enhanced resolution on the entire surface of the screen, measuring from 42 lines/mm in the centre to 32 lines/mm on the edge. CF-Super Tube Combination of the tube and 50mm R-Contact objective lens provides crisp and geometrically precise image without distortion even in the peripheral areas of the tube’s screen.